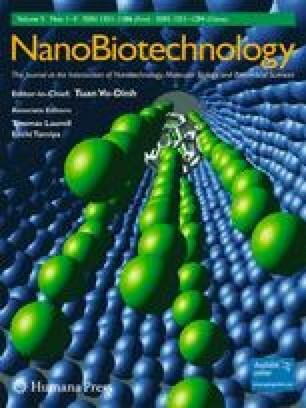 The bioelectrochemistry of the blue copper protein, pseudoazurin, at glassy carbon and platinum electrodes that were modified with single-wall carbon nanotubes (SWNTs) was investigated by multiple scan rate cyclic voltammetry. The protein showed reversible electrochemical behavior at both bare glassy carbon electrodes (GCEs) and SWNT-modified GCEs (SWNT|GCEs); however, direct electrochemistry was not observed at any of the platinum electrodes. The effect of the carbon nanotubes at the GCE was to amplify the current response 1000-fold (nA at bare GCE to µA at SWNT|GCE), increase the apparent diffusion coefficient D app of the solution-borne protein by three orders of magnitude, from 1.35 × 10−11 at bare GCE to 7.06 × 10−8 cm2 s-1 at SWNT|GCE, and increase the heterogeneous electron transfer rate constant k s threefold, from 1.7 × 10−2 cm s−1 at bare GCE to 5.3 × 10−2 cm s−1 at SWNT|GCE. Pseudoazurin was also found to spontaneously adsorb onto the nanotube-modified GCE surface. Well-resolved voltammograms indicating quasi-reversible faradaic responses were obtained for the adsorbed protein in phosphate buffer, with I pc and I pa values now greater than corresponding values for solution-borne pseudoazurin at SWNT|GCEs and with significantly reduced ΔE p values. The largest electron transfer rate constant of 1.7 × 10−1 cm s−1 was achieved with adsorbed pseudoazurin at the SWNT|GCE surface in deaerated buffer solution consistent with its presumed role in anaerobic respiration of some bacteria.